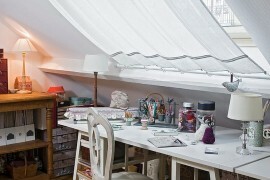 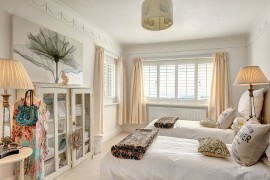 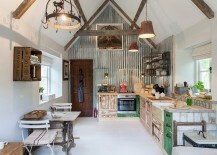 Shabby chic is much more than another style on the decorating spectrum. 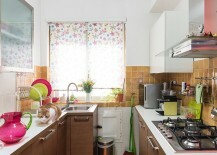 It is a lifestyle choice and a philosophy that encourages you to surround yourself with décor that feels comfortable and practical. 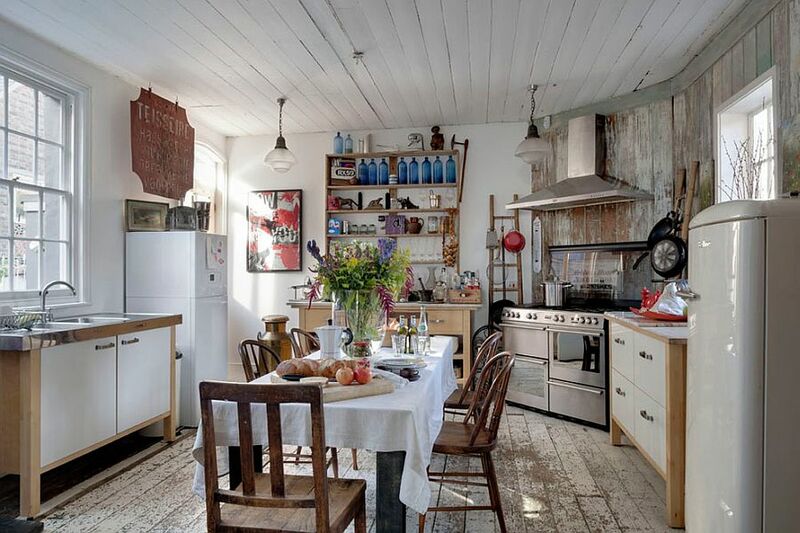 Much like other styles born out of a counter-culture revolution, at its heart, it shuns consumerism and asks you to celebrate the old, the weathered and at times the discarded. 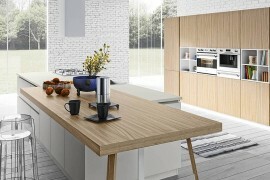 For a generation that is gravitating toward sustainability and eco-friendly design, it almost seems like the perfect fit. 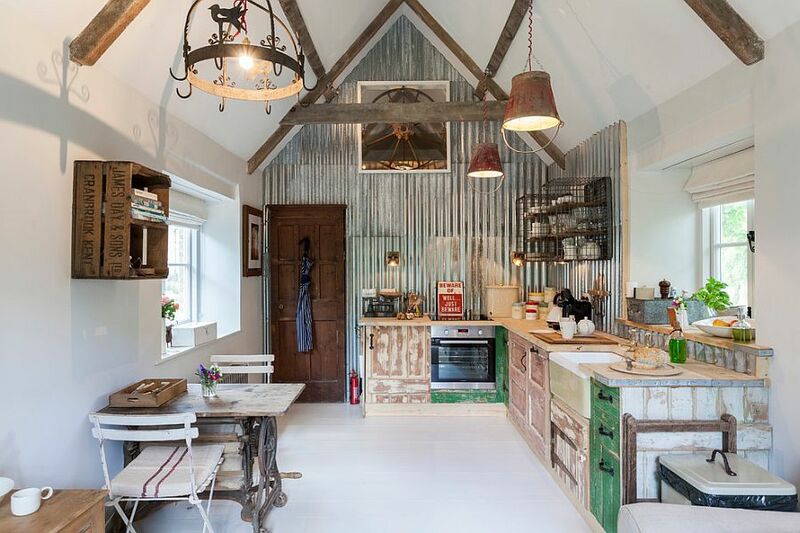 Having already showcased gorgeous shabby chic bedrooms and living rooms, today we take a look at some of the best kitchens that embrace the style. 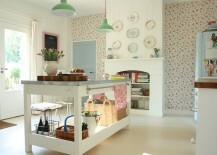 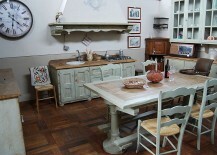 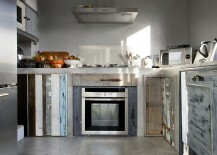 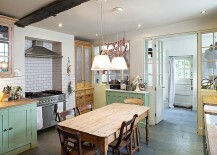 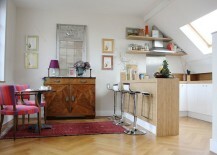 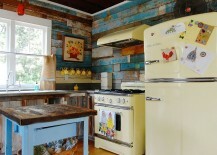 Trying out shabby chic style in the kitchen is a lot easier than in the bedroom or the living room. 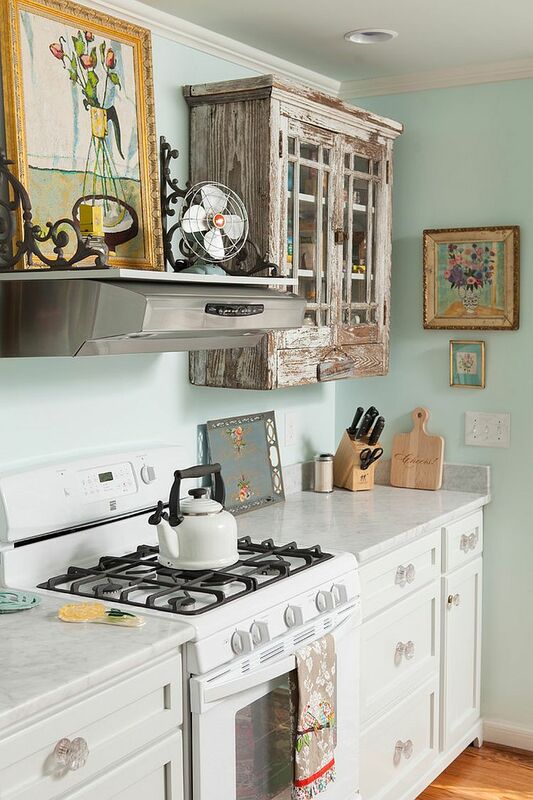 For starters, we absolutely love the fact that many homeowners are far more comfortable in breaking conventions and finding their own version of shabby chic style in the kitchen. 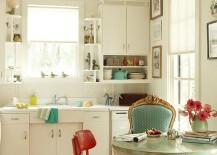 Essentially, this is what the style is all about! 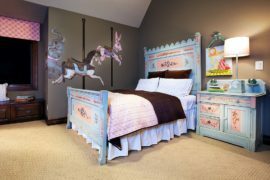 So, as you flip through these 50 gorgeous inspirations, make sure that you pick up individual elements you like and give them your own fun twist! 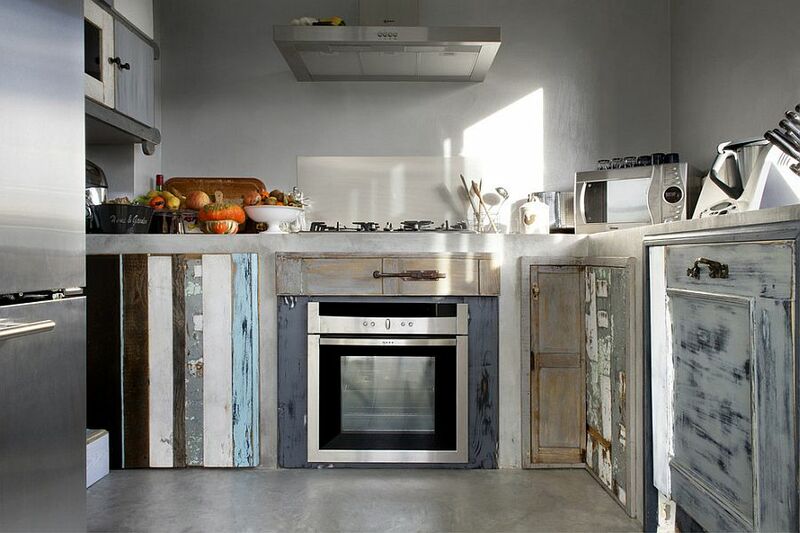 Do not be constrained by the rigid definitions of shabby chic, and always experiment and tweak things to give your kitchen a unique personality. 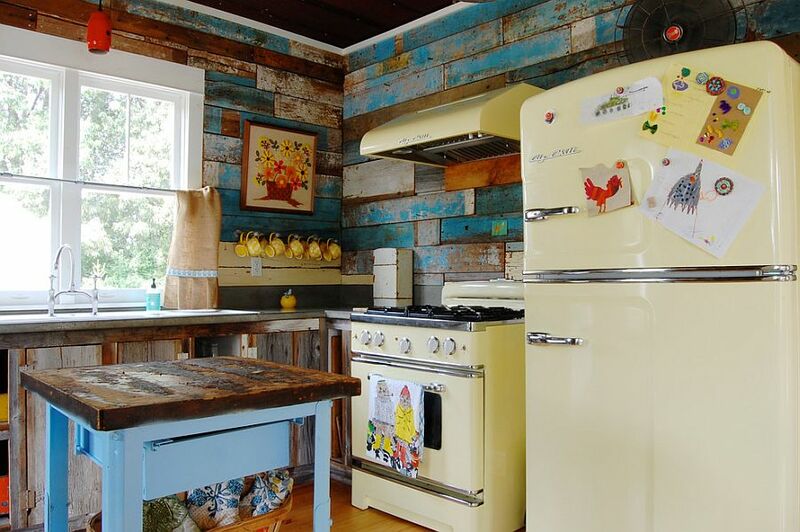 Shabby chic is a style that allows you to decorate with a beautiful blend of aesthetics and ergonomics without actually breaking the bank. 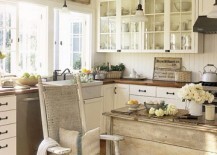 You can introduce a hint of coastal charm, an elegant undercurrent of beach style, a dash of French panache or classic cottage and farmhouse themes into the shabby chic kitchen. 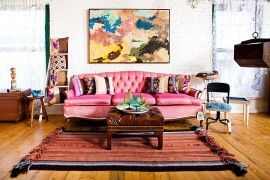 This is a style that absorbs these vibrant variants effortlessly and grows organically over time. 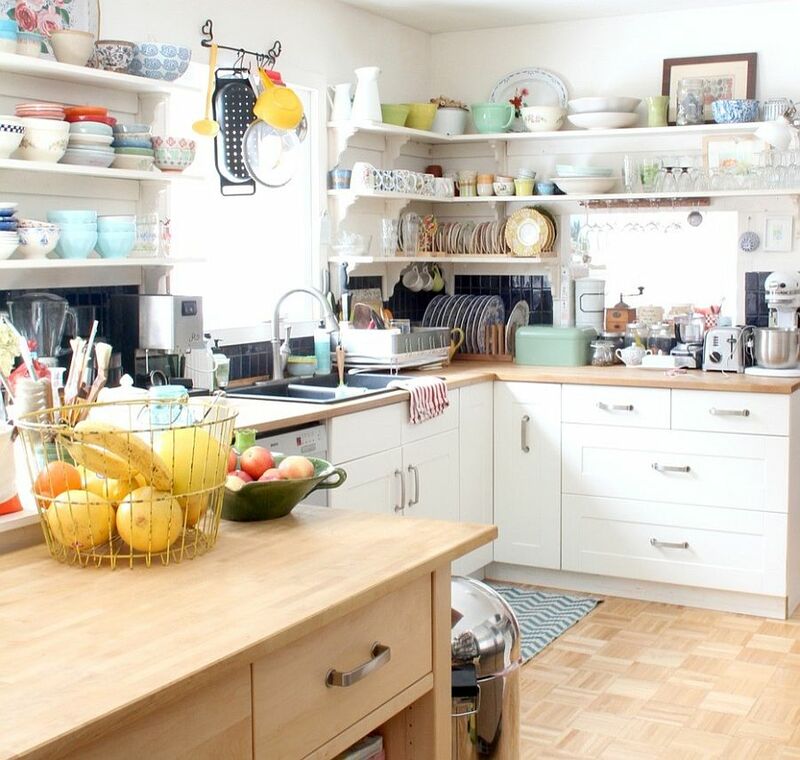 What you need in your kitchen should basically shape it, and shabby chic style provides ample room to maneuver décor around to achieve this goal. 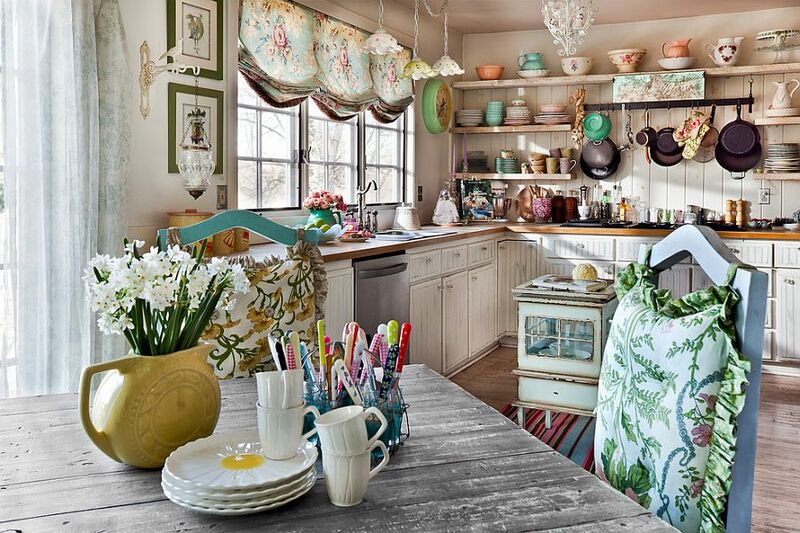 Since it is often flea market finds, vintage accessories, reused cabinet doors and rustic accents that shine through in the shabby chic kitchen, ease and elegance are what you find in these spaces. 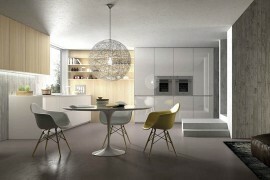 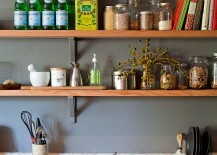 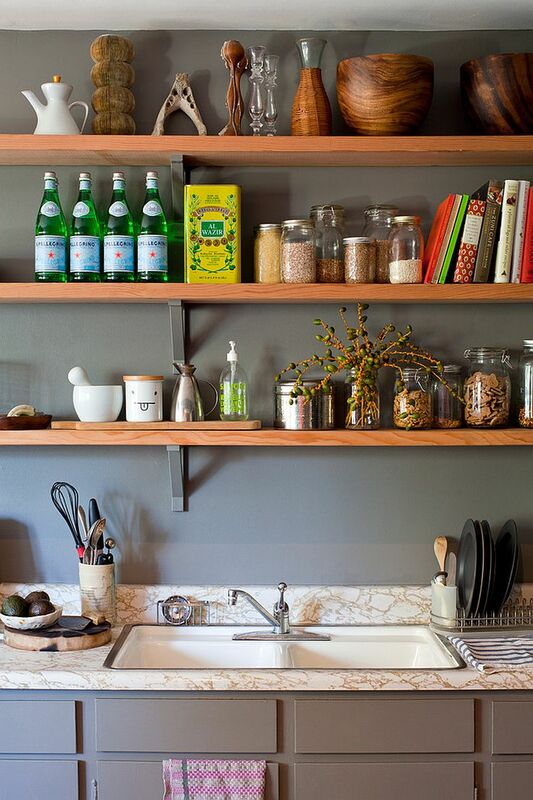 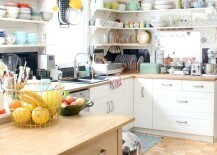 One cannot really talk about kitchens without discussing cabinets, shelves and other storage options. 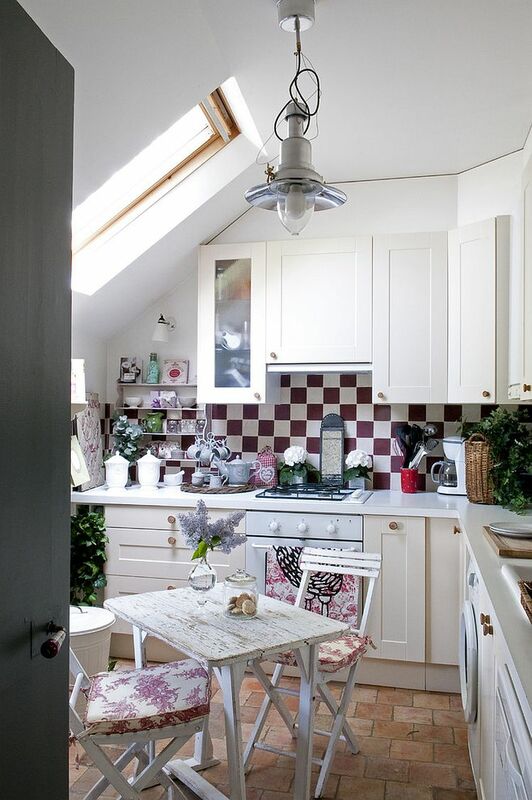 The shabby chic kitchen lets you move away from the mundane and almost ‘expected’ design of kitchen cabinets to those that will intrigue and inspire. 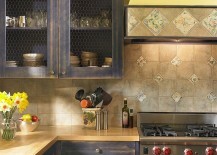 It is the distressed finish that is the most popular in these kitchens, with traditional and shaker-style cabinets coming in a close second. 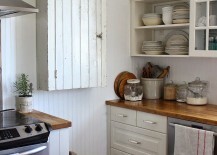 Another staple of these kitchens is the open shelves that draw their inspiration from old farmhouse and country kitchens. 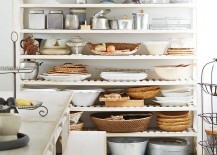 These woodsy shelves allow you to display your kitchenware proudly and give the shabby chic kitchen an air of authenticity. 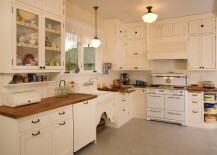 While talking about storage options, another important component to consider is the kitchen island. 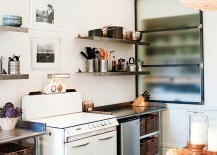 The last few years have seen homeowners almost ‘demanding’ one, often to the detriment of their kitchen! 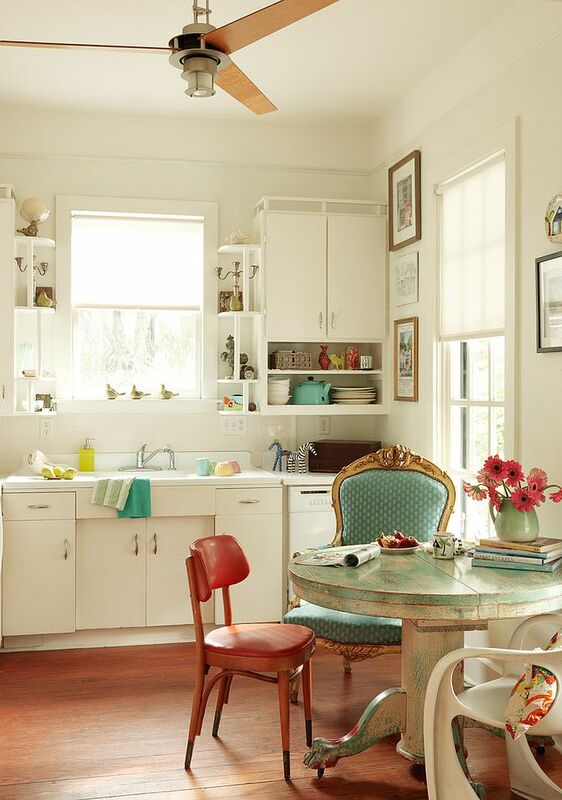 If you really feel that the island fits in with the floor plan of your kitchen, then using an old, salvaged table or a flea market find is a great option in the shabby chic space. 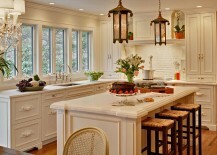 You can give them a quick face-lift, and they also double as beautiful, informal breakfast zones and dining areas. 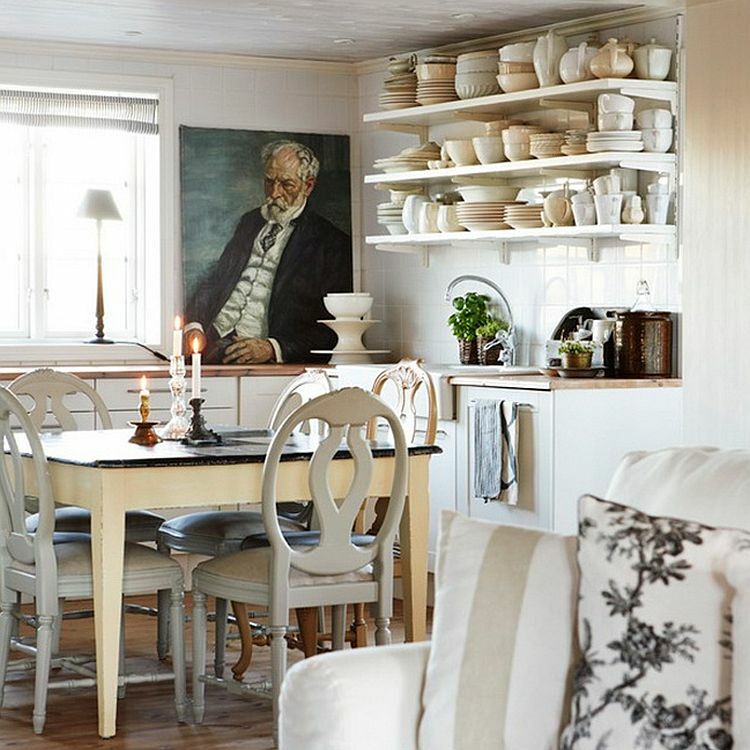 Yes, shabby chic is about luxury, elegance coupled with the old, and antique and vintage finds carefully placed to steal the spotlight in the room, but there are plenty of ways to go about achieving this look. 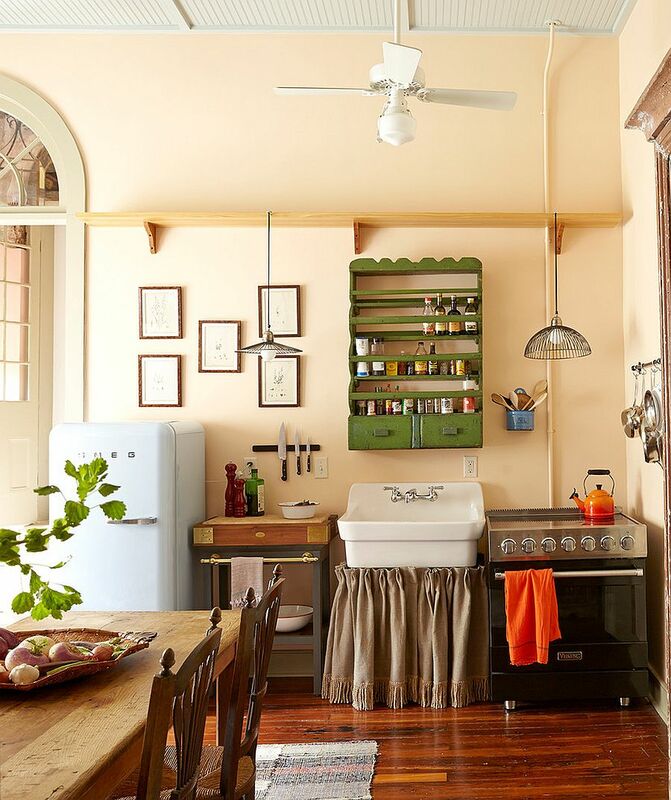 While some prefer the shabby aspect of the style, others tend to feel comfortable with a kitchen that is more modern or contemporary. 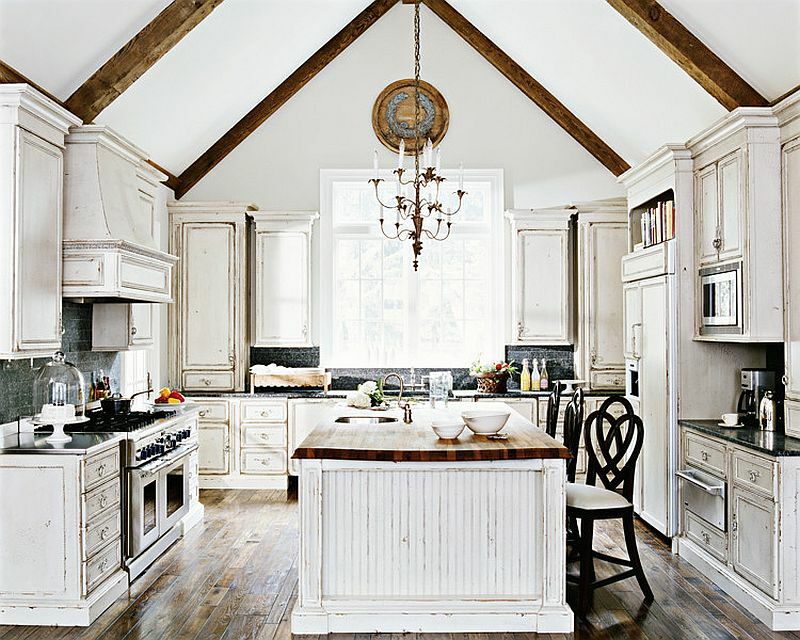 If you are one of those who prefers the ‘chic’ side of things, these kitchens will surely seem a lot more to your liking. 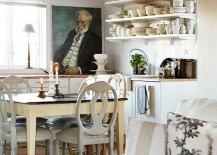 It is a look that is perfect for the supposed ‘beginners’ who want to try out the style before committing to it fully. 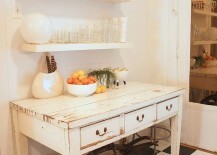 Start off by incorporating pieces such as a distressed cabinet, an antique hutch in the corner or a breezy island-table, and you will quickly find out whether this is a style that works for you. 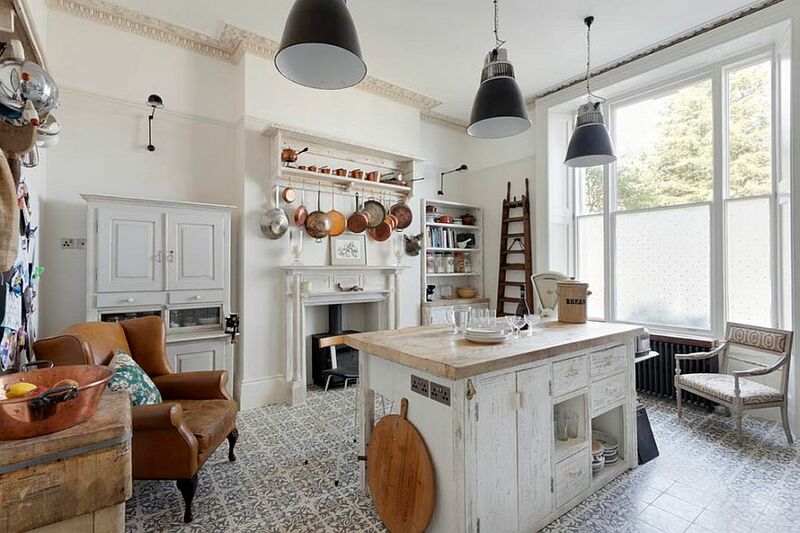 One thing that we love about shabby chic kitchens (something that is not always true in the case of bedrooms and living rooms in the same style) is that they seem to veer away from an overdose of white. 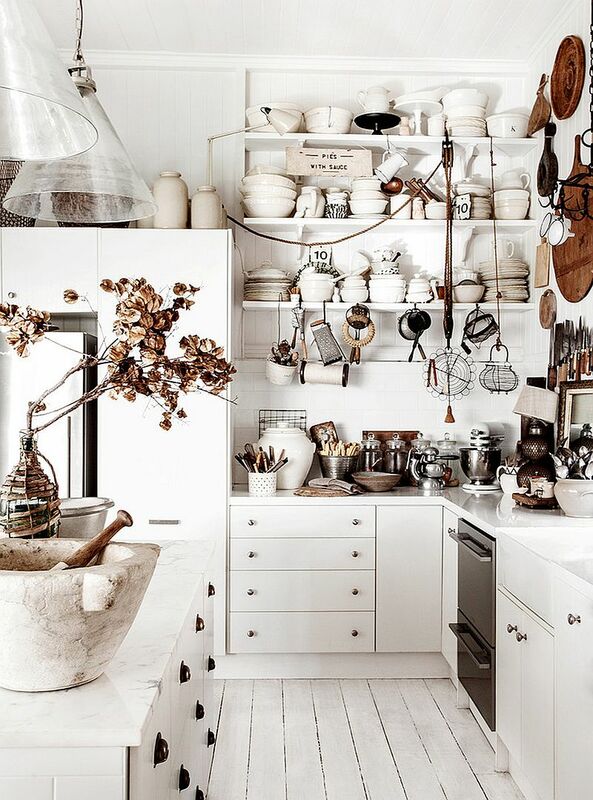 Maybe it is the presence of kitchenware and appliances or just a reluctance to use too much white in the kitchen because of practical reasons (read that extra time spent cleaning) that is the reason for this limited use of shades of white. 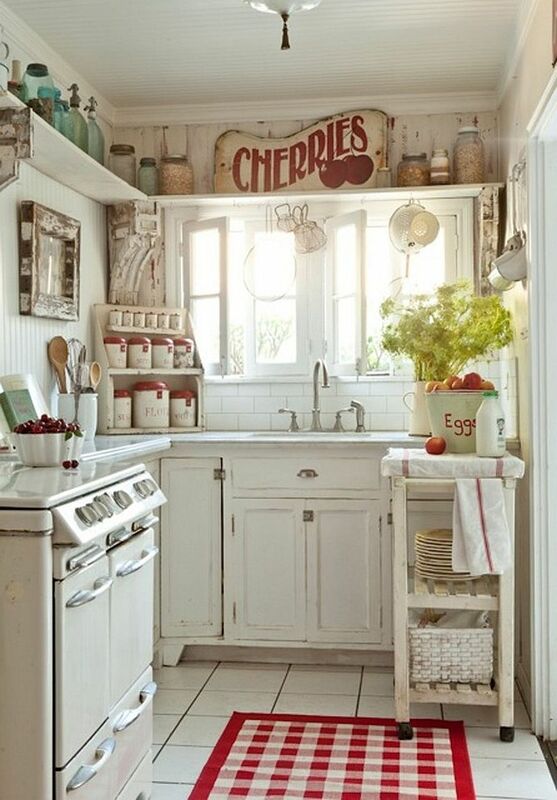 But if you still want a sparkling, all-white kitchen with a hint of femininity and loads of personality, then shabby chic is definitely the way forward. 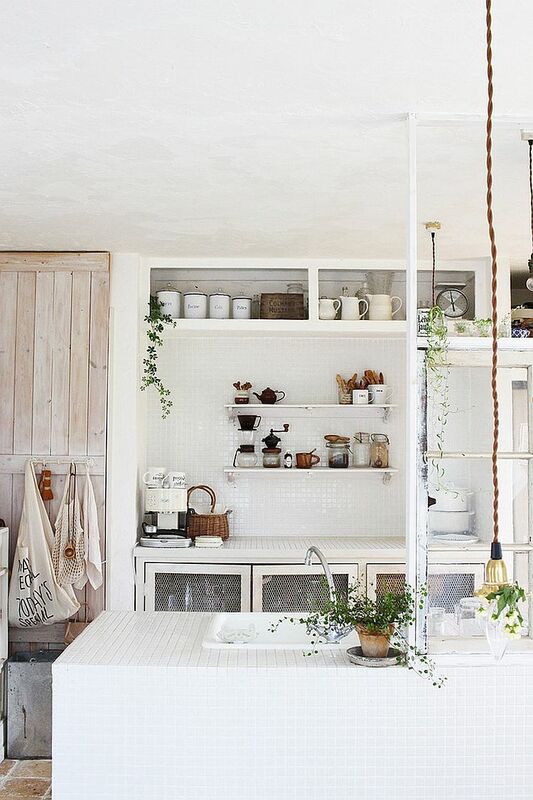 Since beige has faded into the backdrop thanks to the popularity of gray, you can try shades of light cream and off-white instead of just sticking to an all-white backdrop. 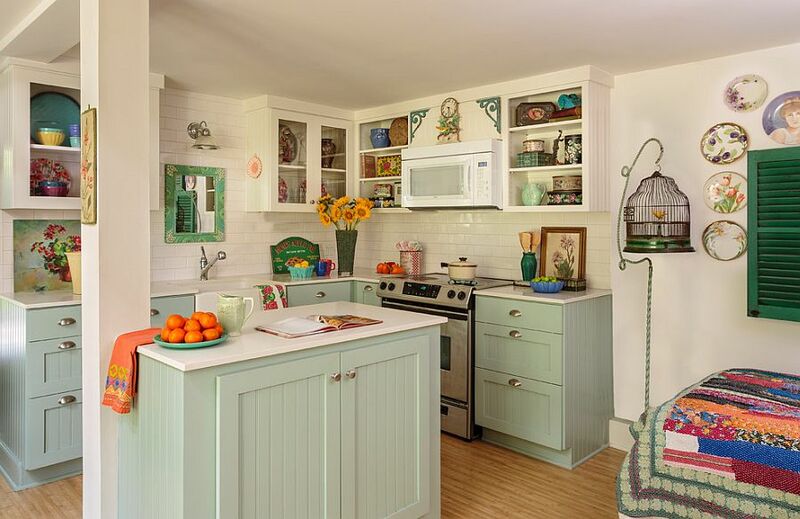 This adds more visual depth to the kitchen, and a few smartly-placed pastel hues or an accent wall clad in wallpaper creates a blend of retro and shabby chic styles that is truly sumptuous. 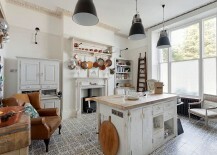 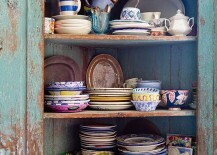 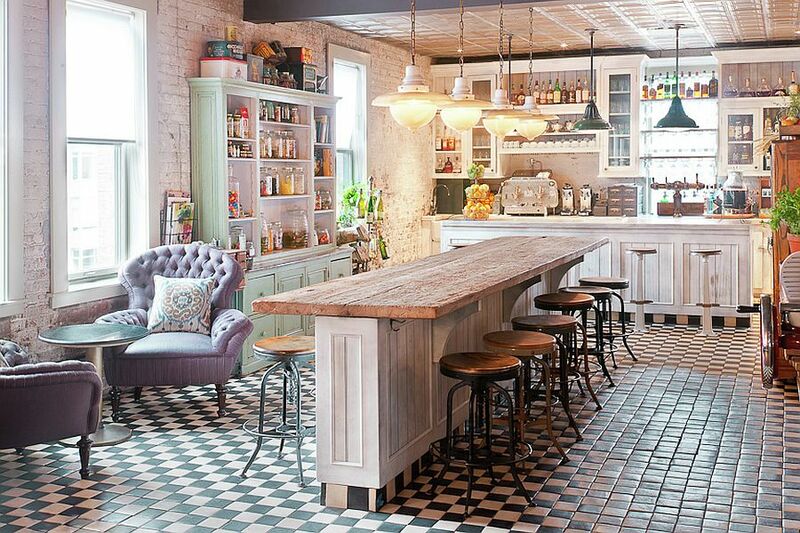 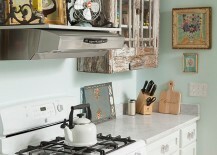 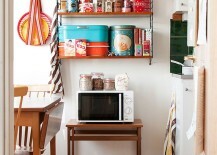 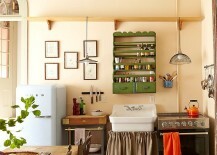 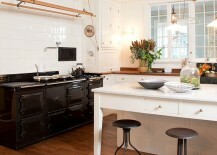 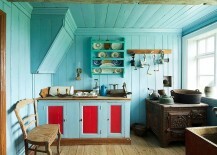 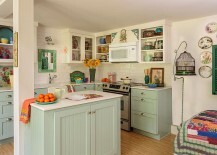 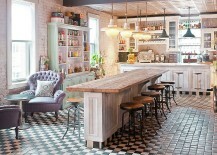 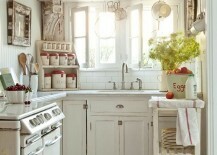 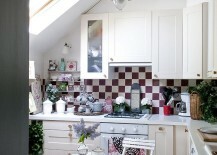 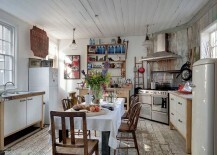 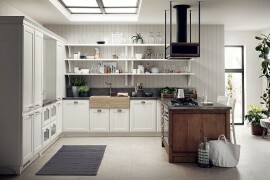 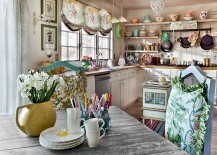 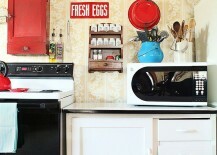 Few styles work as charmingly in small kitchens as shabby chic. 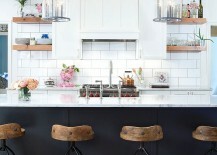 For starters, the style allows you to use pretty much any revamped table or salvaged décor piece as a tiny kitchen island. 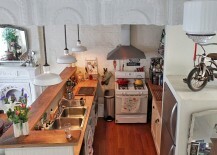 This definitely is a plus in small kitchens where one cannot stick to rigid conventions that demand a more conventional central island. 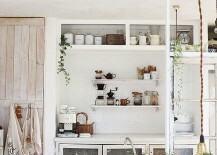 Then there is the series of open shelves we alluded to earlier, which give the limited area an airy appeal while fully utilizing the existing vertical space. 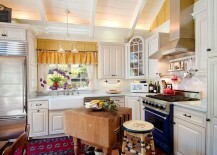 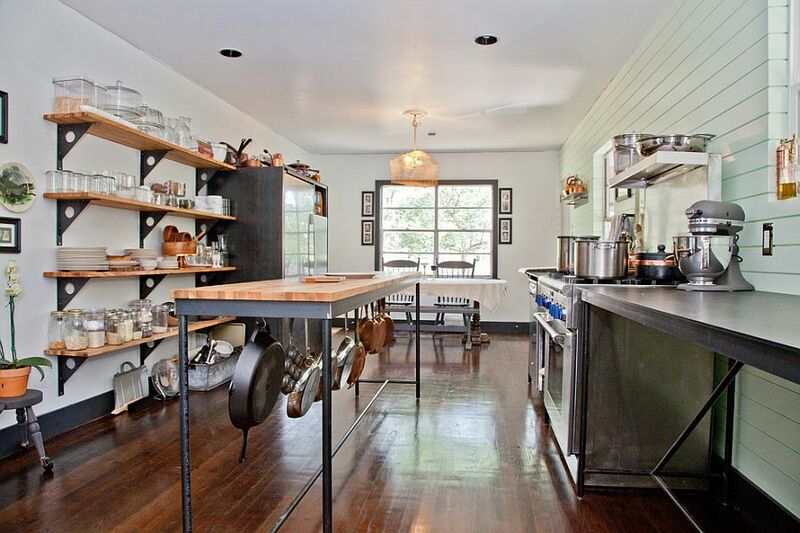 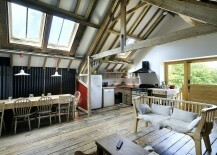 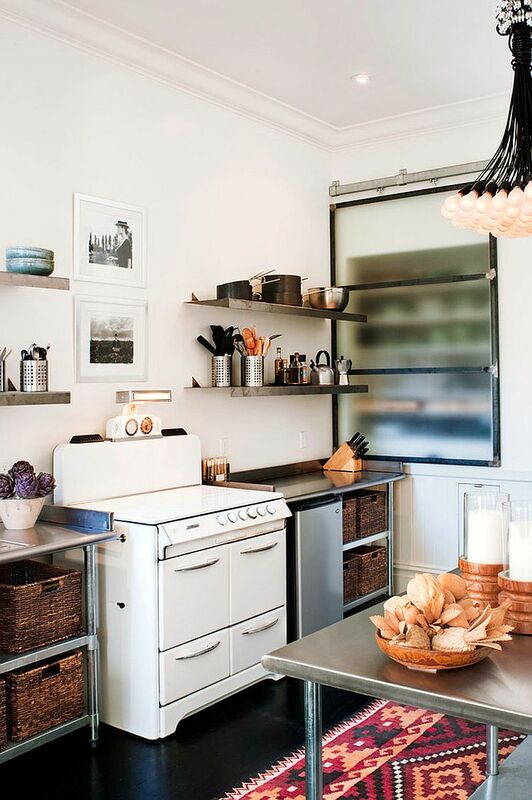 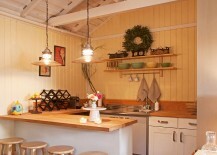 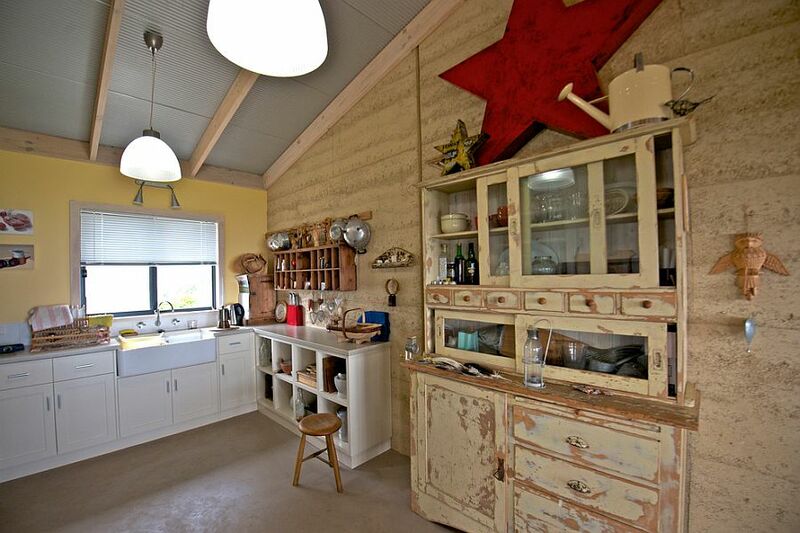 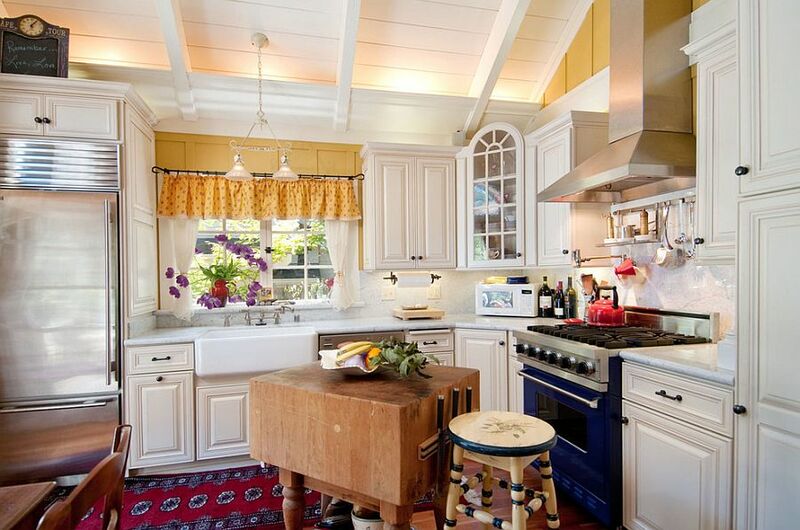 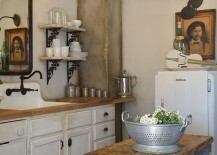 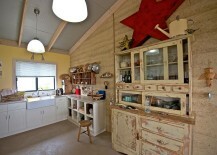 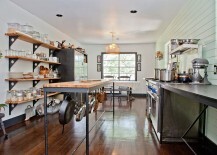 The small kitchen seems even cozier thanks to the dashes of rustic brilliance and personal touches that it brings.